Surveys estimate that as much as 83 percent of land in Quang Tri province in Central Vietnam is contaminated by explosive remnants of war. Recent advances in information management and operational methodology have significantly reduced this figure. This article looks at a coordinated response currently being implemented in Quang Tri province in collaboration between MAG (Mines Advisory Group) and Norwegian People’s Aid, and the key factors involved in successfully facilitating this process. Almost 40 years after the end of the war, Vietnam is still considered to have one of the highest levels of unexploded ordnance (UXO) contamination in the world. Of the estimated 15.4 million tons of ordnance used during the war, as much as 10 percent failed to detonate.1 This legacy continues to place communities at risk and restricts access to land required for housing, agriculture, infrastructure and community development. Cluster munitions represent a significant proportion of the remaining contamination and, along with 40 mm grenades, are responsible for the majority of civilian deaths and injuries. Significant post-war clearance efforts have been carried out by both the military and nongovernmental organizations (NGO) using funding sourced from the national budget as well as from institutional donors, including the Office of Weapons Removal and Abatement in the U.S. Department of State’s Bureau of Political-Military Affairs (PM/WRA) and the governments of Germany, Ireland, Japan, Norway and the United Kingdom.2 Particularly around the former Demilitarized Zone, NGO efforts have focused on provinces in central Vietnam, which is considered to be the most contaminated part of the country. Despite this work, there is no reliable way to measure the extent and scope of the remaining contamination, in part due to outdated survey methodology and an underdeveloped information management system. In the last two years, however, significant progress has been made in the development of a national mine action program and in the coordination of mine action activities at the provincial level. These advances created an opportunity to undertake a more strategic analysis of how remaining contamination in Vietnam could be tackled. 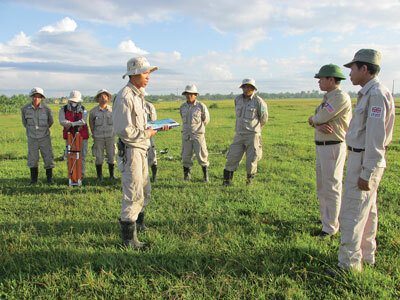 Mine action organizations in Quang Tri have historically operated in administrative locations known as districts, with each operator working according to their own operational methodology. Districts have been allocated by the Department of Foreign Affairs (DoFA), the body within the provincial authority responsible for coordinating international mine action NGOs. 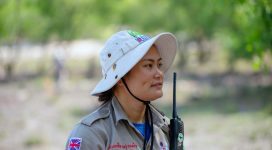 Both Norwegian People’s Aid (NPA) and MAG have worked in Central Vietnam. NPA, which works in Cam Lo, Dakrong, and Trieu Phong districts, has piloted and adapted the Cluster Munition Remnants Survey (CMRS), initially developed by NPA in Laos.3 MAG’s area of operation includes Vinh Linh and Gio Linh districts, where the emphasis has been on clearance in support of development activities and on conducting explosive ordnance disposal (EOD) tasks as a response to local needs. Following advances in provincial level information management systems in late 2013, NPA and MAG began to discuss potential collaborative opportunities for increasing the efficiency and effectiveness of the land release process. 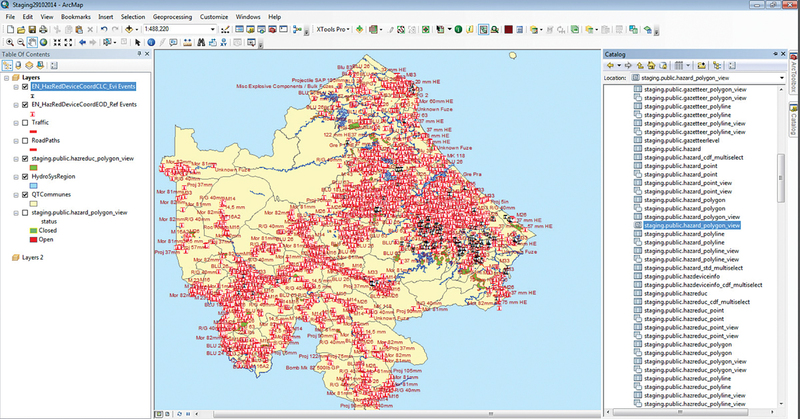 NPA’s data generated from the CMRS provided more detailed information about contaminated areas than had previously been available. However, the lack of follow-on clearance risked decreasing the effectiveness of the survey information; there would be no lessons learned to provide feedback and further refine the survey tool. Operational in Quang Tri for a number of years, both organizations had significant staffing and equipment assets as well as strong relationships with the authorities at the provincial and district levels. Together with the provincial authorities, MAG and NPA discussed the idea of operators deploying their assets province-wide and working on the basis of activity rather than being limited to specific districts.4 In early 2014, DoFA granted MAG permission to work in Trieu Phong district to conduct clearance of confirmed hazardous areas (CHA) that contain cluster munitions and have been generated through the CMRS process. MAG and NPA teams in the field discuss the handover of a cluster munitions CHA. NPA and MAG have continued to work together to develop this approach. Implementation of the CMRS in Trieu Phong and Cam Lo districts enabled NPA to estimate the extent of the remaining cluster munition contamination affecting the province. The data suggests that slightly more than 55 km (34 mi), or nearly 1.2 percent of the total land surface area is contaminated with cluster munitions and other UXO, a significant reduction in the estimates of previously conducted surveys. Using this estimate and the data from MAG’s clearance trials, MAG and NPA developed a plan to conduct CMRS and follow-on clearance of all CHAs within a five-year period. The development of this project in Quang Tri is possible for two main reasons. The strength of the partnership among NPA, MAG and the provincial authorities has ensured trust and transparency between the organizations involved. Moreover, the establishment of the provincial database unit (DBU) in Quang Tri in 2013 provided a focal point for provincially-held information on contamination. ERW found in Quang Tri by EOD clearance activities via a live connection from provincial IMSMA to ArcGIS. Partnership and Information Sharing. Effective partnership and the adoption of a coordinated approach to deal with the remaining contamination problem in Quang Tri province is the foundation upon which this project is built. To date, MAG has provided NPA with feedback from its experience clearing CHAs to develop and refine the CMRS methodology. In turn, NPA has been able to improve its CMRS methodology to more accurately define CHAs. 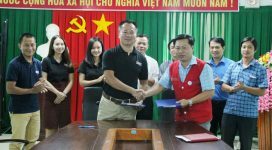 In building an effective partnership, MAG and NPA have created an opportunity for other organizations and operational stakeholders to become involved, establishing a model of cooperation as the standard for Quang Tri province. Organizations are also discussing how to share expensive mechanical assets that will increase the value of donors’ money. Information Management and Improved Communication. The DBU was set up in Quang Tri in 2013, becoming fully operational in October 2013. Previously, operators maintained organizational databases with individual reporting formats. Hence, obtaining a province-wide picture of the survey and clearance activities undertaken to date was impossible. All operators now provide information in a standardized format to the DBU on a monthly basis. 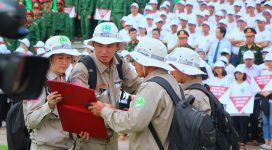 In turn, operators receive an updated version of all mine action operational data in Quang Tri. This has allowed NPA and MAG to map, analyze and estimate the extent of the overall contamination within the province. The DBU also provides MAG with all the relevant information regarding the CHAs that it will clear. This initiative has been key to MAG’s and NPA’s collaboration, ensuring operations and survey data across the province are accessible and transparent. The creation of the DBU has been instrumental in demonstrating to the provincial authorities how organizations can coordinate and cooperate, and has ultimately led to the approval of– a province-wide operational memorandum of understanding for both MAG and NPA. This project demonstrates a new approach to survey and clearance in Vietnam. It is built on strong relationships with local authorities and places an emphasis on the critical role of information management. Combined with strong collaboration between operators, these elements have facilitated efficient and targeted clearance in Quang Tri, maximizing outputs, reducing the impact of UXO contamination and improving the program’s success. MAG and NPA intend to continue documenting and analyzing the progress of the project, and will continue to share lessons learned to create a successful model for clearance of the remaining UXO contamination in central Vietnam. 1. “Contamination Situation.” Bomicen. Technology Centre for Bomb and Mine Disposal. 11 November 2014.http://bit.ly/1ur8Tnz. 2. Paterson, Ted and Griffiths, Thao. “Assessment of Vietnam’s National Mine Action Program.” The Journal of ERW and Mine Action. Accessed 20 January 2015. http://bit.ly/1uqIjvC. 3. Creighton, Michael, Karlsen, Atle and Qasim, Mohammad. “Cluster Munition Remnant Survey in Laos.” The Journal of ERW and Mine Action. Accessed 20 January 2015. http://bit.ly/1fARvnS. 4. Activities under the land release process include non-technical survey, technical survey and clearance.